At Marco, growth is part of our culture. It defines who we are and where we’re going. Our vision is to be a growth-driven technology services company admired for our people and our performance. But we can’t get there on our own. Our strategy combines 50% organic growth with 50% acquired – or purchased – growth. So, we need client-focused companies who’ll help us expand our technology services nationally. It all starts with a great culture. 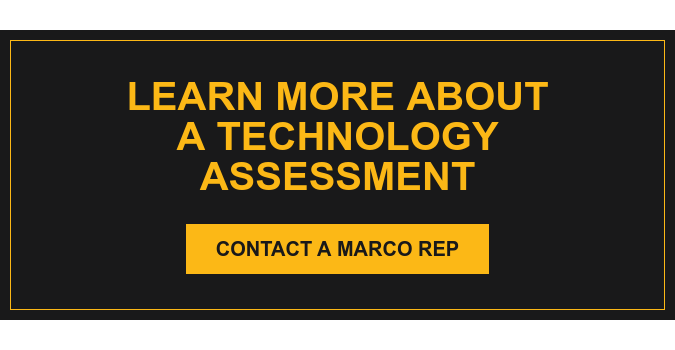 Becoming part of the Marco team comes with a host of benefits. At the top of the list is our positive employee culture. It’s not uncommon for someone to walk into one of Marco’s offices and ask to apply for any and all open positions just to be part of our team. We believe in a healthy work-life balance, listening to our employees, offering them meaningful challenges and rewarding their hard work with great benefits. As a result, we’re consistently voted one of the top workplaces in our region. See what our employees, clients and community members say about how Marco m:powers them to dream bigger and go further. As part of an ever-expanding company, your team will have opportunities for career advancement. Along the way, you’ll be able to provide your clients with additional business IT services. Because of our history of success, we’ve earned the right to work with clients large and small in a variety of industries. Our size allows us to partner with leading technology manufacturers and bring more buying power to the table. That puts us in a position for even more success. Here are more factors that contribute to our success. Think we make a good fit? Contact us. In the meantime, check out Jeff’s blog on Where Growth Comes from Matters.